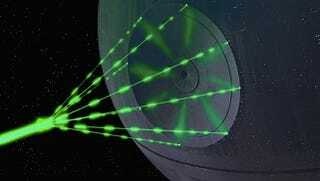 How much energy would the Death Star require to destroy Earth? As iconic as the spherical death-bringer is, the inner tinkerings of the Death Star still remain a great mystery. For example, if the Death Star suddenly materialized in the Solar System, how much energy would the vessel require to pulverize the Earth into bloody gravel? Since the Death Star outputs energy equal to several main-sequence stars, even if the actual composition of Earth is used in equation, the value yielded is only a few orders of magnitudes larger and the Death Star can still easily afford to output that energy due to its tremendous power source. However as mentioned above Jupiter requires much greater energy demands which would put considerable strain on the Death Star. To destroy a planet like Jupiter it would probably have to divert all remaining power from all essential systems and life support, which is not necessarily possible. I wouldn't put it above the evil Empire to cut off the oxygen just to eke out that last joule of murder. When you're spending $15.6 septillion, a Luxembourg worth of Stormtroopers is but a drop in the bucket.